U.S. equity markets continued their ascent in the third quarter with all major indices exceeding their January peaks and hitting new all-time highs. Our long-term approach to investing did not fare as well. Value significantly underperformed growth—the S&P Growth Index returned 3.42% points more than its value counterpart. While it is painful to feel like you were not invited to the party, we are confident that value will have its day in the spotlight soon. We believe a portfolio composed of high-quality businesses with strong fundamentals that trade at reasonable prices will perform well over time; however, there may be periods where we underperform like we have recently. The U.S. equity market has been an outlier globally this year as a strong economy fueled by tax cuts has helped insulate it from the turmoil seen in some foreign markets. The U.S. debt market is a different story, however, and has been moving lower. The Fed raised rates in September for the third time this year and the market pegs a 77% probability that another increase will occur in December. The Treasury market has reacted by selling off to the point where some yields are at the highest levels since 2011, when U.S. government debt was downgraded. On the surface things look great domestically—GDP is growing at a fast rate (bolstered by corporate tax cuts), consumer spending is strong, and unemployment is at a 40-year low. But where do we go from here? We are interested to see what impact threatened and already enacted tariffs will have on growth in the fourth quarter and early 2019. Perhaps the market is already beginning to factor in slower growth and higher rates. As I write this, we are seven trading days into October and month-to-date returns are -4.33% for the S&P 500 and more than 7% declines for small caps and technology indices. September 30th marked our fiscal year end for the Intrepid Disciplined Value Fund (the “Fund”). We are not pleased with a return of 1.06% for the trailing year compared to a return of 17.91% for the S&P 500. A few securities had an outsized negative impact on performance. In fact, the three largest detractors were a drag of -5.5% on the trailing 12-month return. The Fund returned 0.19% for the third quarter of calendar year 2018 compared to 7.71% for the S&P 500. The top contributors for the year include Apple (ticker: AAPL), Royal Mail PLC (ticker: RMG LN), and Cheesecake Factory (ticker: CAKE). 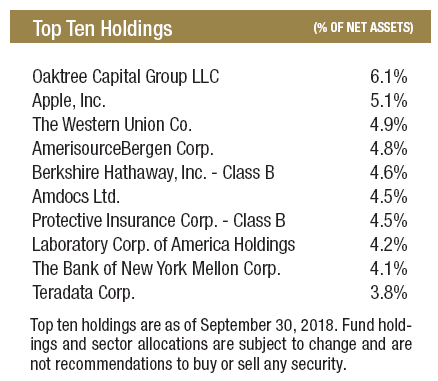 For the third quarter, the top contributors were Apple (ticker: AAPL), Berkshire Hathaway (ticker: BRK/B), and AmerisourceBergen (ticker: ABC). We purchased shares of Apple a few years ago when the company was trading at a material discount to intrinsic value. At the time, investors were worried about potential margin pressure and feared a slowdown in iPhone sales would weigh on performance. Since then, the company has continued to innovate and find new growth avenues of high margin revenue. While the iPhone market has matured, its Services and Other categories are growing very quickly. The company announced early this year it would reduce its net cash balance from $163 billion to zero, and it is doing so through shareholder-friendly activities. Apple’s world-class management team has successfully increased the company’s intrinsic value over the years, but after the significant appreciation in the stock price following recent results, we reduced our position by a small amount. Royal Mail PLC has been a roller coaster over the past year. While it was a top contributor for the trailing 12-month period ending September 30, 2018, the stock gave up all of its gains and then some in the days since. The company is struggling to grow its top line at the same time it is facing increased costs. We believe these headwinds will be challenging to overcome, so we exited the position after quarter end. We purchased Cheesecake Factory about a year ago after shares had fallen precipitously. The company was experiencing negative same-restaurant sales growth and significant margin pressure. Growth has since turned positive, but the margin issues remain as increased labor costs have proven difficult to overcome. Speculation earlier this year that the company was a takeover target pushed shares higher, at which point we reduced our position. Management is acutely focused on improving margins and we believe any incremental improvement over the next few quarters will help alleviate those concerns. For the year, Corus Entertainment (ticker: CJR/B CN) hurt performance by about 3%. We have written about the company extensively in the Intrepid Endurance Fund quarterly commentary over the past few years, including in the first quarter of 2018. Admittedly, we were wrong, and the position should have been sold sooner, but it is no longer in the Fund. Net 1 UEPS Technologies (ticker: UEPS) has been a volatile holding. There are many moving parts and very little sell-side coverage, which we believe has led to confusion amongst investors. As of October 1, the company’s legacy contract with the South African Social Security Agency (SASSA) is no more. We view this as a net positive. UEPS’ fast-growing EasyPay Everywhere (EPE) banking offering will offset much of the foregone revenue, and our hope is that UEPS will no longer be the South African media’s scapegoat for the myriad issues plaguing SASSA. A positive development was recently announced when the Supreme Court of Appeal of South Africa ruled in UEPS’ favor to continue letting grant recipients choose any bank account they like to receive their grant payments. Furthermore, recipients can transact freely with any service provider, utilizing the full functionality of their bank accounts with the money from those grant payments. This bodes well for EasyPay Everywhere, as grant recipients can continue receiving grant money in their EPE accounts and, in turn, utilize UEPS’ vast financial services infrastructure. That infrastructure includes the most extensive distribution network of mobile and fixed ATMs in South Africa (~2,000) and access to services like microloans, life insurance, prepaid utilities, telecommunications products, and other offerings typically not available to the unbanked. UEPS’ balance sheet alone supports its valuation. Its equity investments along with its ownership of KSNET Inc., one of the largest South Korean payment companies, combine to be worth much more than its current market capitalization. We believe once the company proves its South African business can thrive despite the SASSA contract expiring, the market will recognize the value in UEPS. Western Digital (ticker: WDC) is a position we have owned for a few years. Its business is divided into two parts: HDD (hard disk drives) and NAND memory, which can be used in many applications including solid state drives. Revenue is about equally spilt between the two businesses, but NAND carries a much higher margin. The two technologies are substitutes in many instances, with each having its own set of strengths and weaknesses. HDDs are much cheaper on a per gigabit basis but lack the performance capabilities of NAND. When NAND prices are high, demand for HDDs increases, and vice versa. Despite what we consider a hedge of sorts, investors only seem to care about the NAND business, and more specifically where NAND pricing is going moving forward. Unfortunately, pricing weakness started to show up much sooner than management had communicated to investors. It has continued to be the case up through the most recent quarter and has caused a dramatic sell-off in the price of the stock. Fundamentally, the company is doing quite well. The HDD business is exceeding expectations and the NAND business is still wildly profitable. The company is generating massive amounts of free cash flow and continues to grow its operations. However, it is now one of the cheapest stocks in the S&P 500 index. Investors worry that this memory cycle will be like past memory cycles which have seen material swings in pricing. We do not believe this to be the case. We are in the midst of a secular trend of increased demand for memory chips and view Western Digital as well positioned within the marketplace. With inflation on the rise, we are seeing increasing wages at many of the companies we own. The retail industry has been especially vocal on the matter as wage pressures have weighed on margins in recent quarters. This has caused some stocks to sell off, providing us with an opportunity to acquire shares at attractive prices. We increased our position in Dollar Tree (ticker: DLTR) during the quarter. The company reported disappointing results at its Family Dollar banner, revealing weak sales and high costs. However, the Dollar Tree banner continues to perform extremely well. At current prices, the market is assigning almost no value to the 8,000 location Family Dollar franchise. We believe management will make the necessary changes needed to get Family Dollar back on track. Small incremental improvements at the banner will go a long way to improve financials and help bolster the equity price. Again, performance was not what we had hoped for and not what we expected. We are invested alongside you and will continue to work hard to help grow and protect our mutual investments. All investments involve risk. Principal loss is possible. The Fund is subject to special risks including volatility due to investments in smaller and medium sized companies, which involve additional risks such as limited liquidity and greater volatility. The Fund may invest in foreign securities which involve greater volatility and political, economic and currency risks and differences in accounting methods. Mutual funds, ETNs, hedge funds, equities, bonds, and other asset classes have different risk profiles, which should be considered when investing. Prior to April 1, 2013, the Fund was named the Intrepid All Cap Fund. The S&P 500 Index is a broad based, unmanaged index of 500 stocks, which is widely recognized as representative of the U.S. equity market in general. The Russell 3000 Index consists of the 3,000 largest companies in the U.S. as measured by total market capitalization. The S&P 500 Growth Index is the segment of the S&P 500 Index determined by a measure of three factors: sales growth, the ratio of earnings change to price, and momentum. The S&P 500 Value Index is the segment of the S&P 500 Index determined by a masure of three factors: the ratios of book value, earnings, and sales to price. You cannot invest directly in an index. Free Cash Flow measures the cash generating capability of a company by subtracting capital expenditures from cash flow from operations. NAND refers to a logic gate (a circuit), in digital electronics, which produces an output which is false only if all its inputs are true. Opinions expressed are subject to change, are not guaranteed and should not be considered investment advice or recommendations to buy or sell any security. The Intrepid Capital Funds are distributed by Quasar Distributors, LLC.